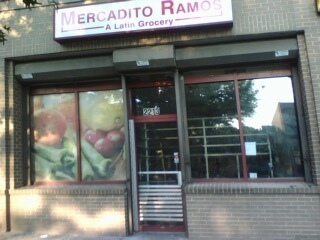 After noticing that Mercadito Ramos had closed, along with the carryout space in the same building – I wondered yesterday if this meant development. Lydia DePillis, over at the City Paper’s Housing Complex, has the answer: yes. Interestingly, the owners of Dupont Italian Kitchen (and the would-be owners of La Fonda at 14th and V) purchased the building in March. Their plans for the space are new retail and office space on the top floors. The building will be renovated and then new tenants will come in. No word on what types of retail tenants will come in, but I will keep you posted. I do doubt the speed at which this will get done, as we haven’t seen any movement on the La Fonda space since November.